Sri Lanka 173 for 7 beat Zimbabwe 29 for 1 in five overs by Duck worth Lewis method by 14 runs. Mahela stroking a brilliant hundred of 64 deliveries with 10 fours and 4 sixers, in a one man show, where the next best was 23 of 19 by Perera and 13 of 6 by Kapugedera. Price 2 for 31 and Lamb 2 for 34 were the main wicket takers. Rain played spoil sport, and when the match was halted after five overs, Zimbabwe were at 29 for one against 43 required to beat the Duck worth Lewis. 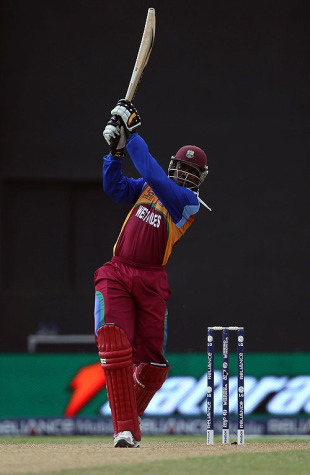 West Indies 60 for 2 in 5.5 overs, beat England 191 for 5, thru Duck worth Lewis method by 8 wickets. England must consider themselves as extremely unlucky. A full match of twenty overs, would have seen England in the drivers seat. England batting was evenly distributed and was a total team effort. Every one at the top contributed. Lumb 28 fo 18, Kieswetter 26 of 14, Kevin Pietersen 24 of 20, Morgan 55 of 35 and wright 45 of 27, took England to a healthy 191 for 5. D.J.G. Sammy 2 for 22, was supported by Bravo, Gayle and Miller with a wicket each. West Indies with an asking rate of over 9.55 runs per over, batted strongly to beat the D/L asking rate of 60 in 6 overs. They lost two wickets to Swann, but finished the match with a win by 8 wickets. Gayle 25 of 12, Chandrapaul 15 of 13 and Fletcher 12 of 10 saw them through. There were 8 wides in the score of 60, which ultimately proved costly for England.